Having forecast as many as 4 rate hikes at the start of December, Goldman - following in the footsteps of the now-dovish Powell - slashed its hawkish bias for 2019 and despite still expecting an above trend economic performance this year, Goldman now sees just one rate hike this year, some time in the second half. But what about the far more important issue of the Fed's shrinking balance sheet? And we know that it is a "far more important issue" because as Goldman wrote over the weekend, despite what Goldman claims is a relatively modest impact on asset classes due to Quantitative Tightening (which makes little sense considering it was Quantitative Easing that served as the biggest catalyst to global push risk assets higher for much of the past decade), it is clear that amidst the heightened market anxiety that followed the Q4 equity market selloff, "a narrative took hold that balance sheet policy was to blame", a narrative which Fed Chair Powell clearly bought into. To Goldman, a "self-fulfilling prophecy effect" was visible in the adverse reaction to Chairman Powell’s comment at his December press conference that runoff was on “automatic pilot.” The market reaction was a sharp contrast with the muted responses shown in the chart below to announcements in 2017 in which Fed officials indicated that runoff would begin earlier than expected, an actual policy change. The reaction appeared to unnerve Fed officials enough for them to offer a soothing change of tone and consider changes to the current plan for runoff. Of course, instead of goalseeking the "narrative" based on the market's reaction as Goldman has done, a simpler explanation is that the market was simply oblivious of the implications of the Fed's balance sheet shrinkage in 2017 when the overarching narrative was that the economy was doing great, and therefore the Fed's shrinking of the balance sheet was not only expected, but a welcome confirmation of this narrative. It is only after the global economy started to sputter in late 2018 that traders began to fret about the incremental reduction in market liquidity due to the decline in Fed assets. 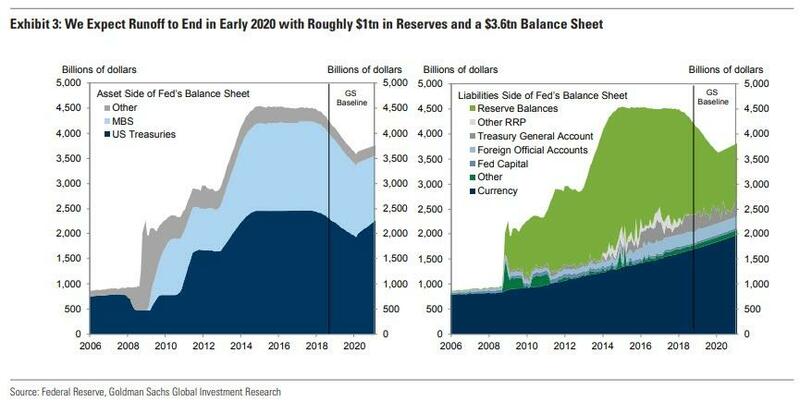 With that said, what is the current status of the Fed's balance sheet unwind and what happens next? Answering the first question first, Goldman notes that about $400bn has gradually rolled off since the Fed first began reducing the size of its balance sheet in October 2017, a modest share of the increase during QE. Additionally, as discussed here previously, the initial caps on runoff of US Treasuries and MBS increased in quarterly steps from an initial combined level of $10bn per month to reach the current peak level of $50bn per month in October 2018, however, the actual runoff has increased more gradually because maturing assets on the Fed’s balance sheet fall short of the UST and MBS caps in most months and therefore runoff has averaged about $28bn per month in 2018 and will average about $37bn per month in 2019 under previously noted projections before concluding in some time in early 2020 according Goldman. 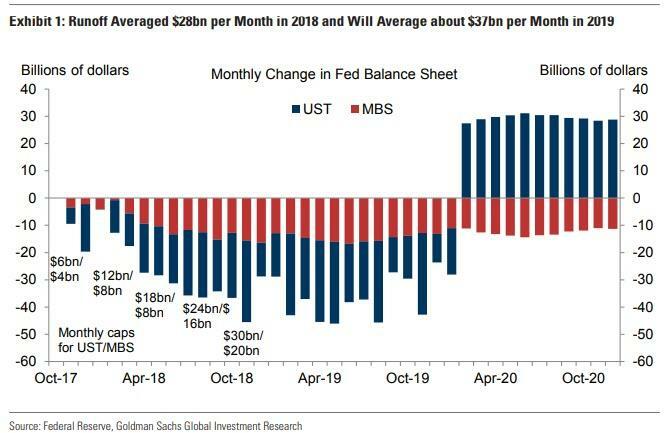 What has been more perplexing to analysts and strategists, is that to date, total assets on the Fed’s balance sheet have declined by only $400BN, from $4.5tn to $4.1tn (the SOMA portfolio has shrunk from $4.2tn to $3.8tn), and as Goldman notes, the reduction so far has unwound only a limited share of the increase during QE: the Fed’s balance sheet rose from roughly 6% of GDP before the recession to a peak of 25% and has now declined to about 20% of GDP. Which brings us to the next key question: i) What is the Fed’s current plan for ending runoff, and ii) Will the Fed change its current plan and end runoff early, and why? The FOMC’s plan described in its 2014 Policy Normalization Principles and Plans is to “hold no more securities than necessary to implement monetary policy efficiently and effectively.” With the Committee’s formal adoption of a floor system for implementing monetary policy at its January meeting, this guidance implies that bank reserve balances on the liabilities side of the Fed’s balance sheet must be kept sufficiently abundant to satisfy intraday liquidity and regulatory needs. Because both the supply of and demand for bank reserves will fluctuate from day to day, Fed officials have also indicated a preference for maintaining an additional “buffer” in order to minimize the frequency with which reserve scarcity emerges and creates heightened volatility in short-term interest rates, requiring the New York Fed to respond with open market operations. Consequently, the end point of runoff is best thought of as somewhat before bank reserve balances decline to the point of true scarcity. 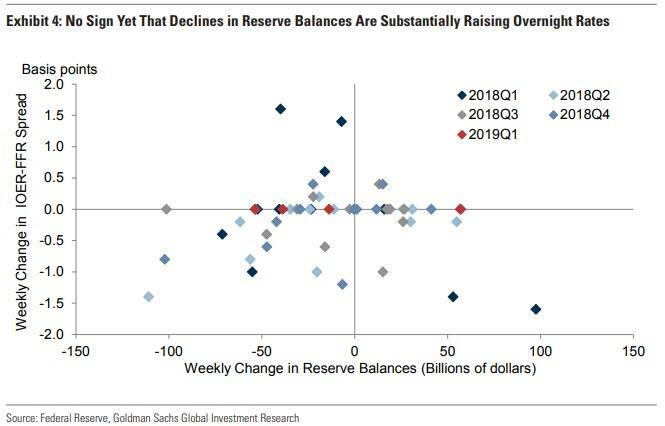 Goldman's best guess remains that this point will be reached when reserve balances fall to roughly $1tn, an assessment which is in compliance with the Fed’s September 2018 Senior Financial Officer Survey, which polled respondents on their current and future demand for reserves. Specifically, reserves currently stand at $1.6tn but are being squeezed in two directions, first by the reduction in the total size of the balance sheet through runoff and second by the growth of nonreserve liabilities such as currency, as shown in Exhibit 3. 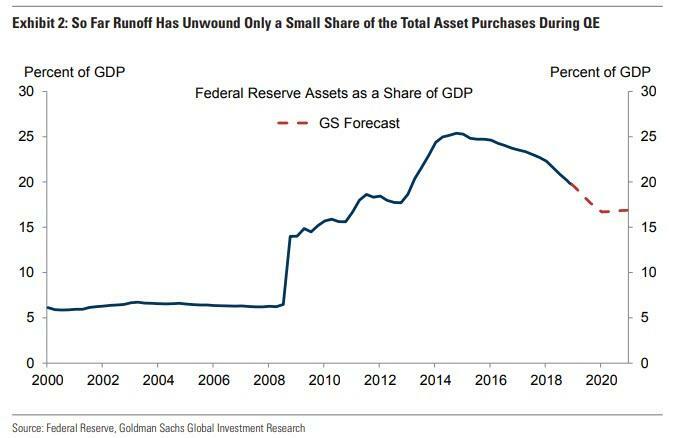 According to Goldman projections reserves will fall to roughly $1tn by early 2020, when the total size of the Fed’s balance sheet stands at about $3.6tn. That said, Goldman admits that exactly when signs of scarcity will emerge is "uncertain" with the bank noting that further realignments of IOER — such as two 5bp relative reductions by end-2019 — could reduce demand for reserves by raising their opportunity cost and induce banks to substitute toward other high quality liquid assets. Possible regulatory changes this year, both formal and informal, also add to the uncertainty. To avoid overshooting the desired end point, Fed officials will monitor indicators of scarcity such as inter-bank lending above IOER, an increase in banks’ daylight overdrafts, and steepness in the demand curve for reserves, as described by Simon Potter, manager of the System Open Market Account for the FOMC, in an October speech. The next chart shows that the last of these indicators—a clear relationship between changes in reserve balances and changes in overnight interest rates—has not yet appeared. Most likely, however, the Fed will merely monitor the market for signs of "financial stress", i.e. selling as the trigger for further activism on the balance sheet. Of course, once the balance sheet reaches its terminal aggregate size, it will likely begin growing again in line with demand for the Fed’s liabilities at roughly the pace of nominal GDP growth, as shown in Exhibit 3 above. In addition, the Fed will reinvest maturing MBS in UST in order to return to a portfolio consisting primarily of Treasury securities. These two factors will result in sizeable UST purchases, as shown in Exhibit 1 up top. 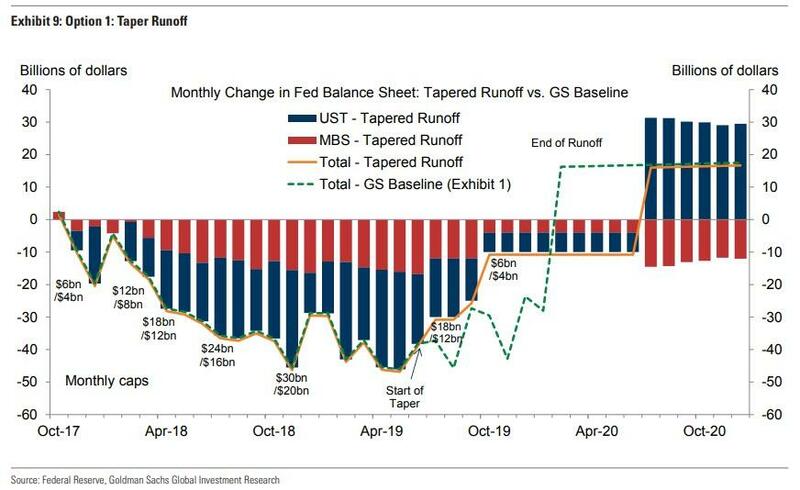 This, then brings us to the $4.1 trillion question: Will the Fed change its plan and end runoff early, as the Fed strongly hinted it may last month, and why? As Goldman explains, Fed officials appear sympathetic to possibly slowing the pace of reserve shrinkage, but concedes that "it is hard to know at this point" noting that in his January press conference last week, Chairman Powell noted that the market is now looking for greater clarity on the Fed’s balance sheet plans. The formal choice of implementation framework at the January meeting clears the way for the FOMC to provide further guidance or make a change to its current plans at one of its future meetings. This likely means that there are three options going forward. First, without changing its current plan, the FOMC could provide information about the likely end-date of runoff. This could involve offering explicit Committee guidance, or simply summarizing the results of the Senior Financial Officer Survey or private sector projections such as those in the Primary Dealer Survey, where the median forecast is now roughly in line with Goldman's expectations. The disadvantage—and the likely reason Fed officials have not done this yet—is that it could limit policy flexibility by projecting false certainty about what end point will ultimately be appropriate. But the hope would be to calm markets. Second, the FOMC could taper runoff, a possibility mentioned in the December minutes. A slower pace of portfolio redemptions could mean, for example, a gradual reduction in the runoff caps similar to the gradual increase at the outset. The chart below illustrates a hypothetical scenario in which the FOMC reduces the UST/MBS caps to $18bn/$12bn at its June meeting (effective in July) and then reduces them further to $6bn/$4bn three months later. This would delay the end of runoff by 1-2 quarters because the lower caps would be binding in many months. A potential concern with tapering is that it might be misinterpreted as a major change in the monetary policy stance or as implying that runoff will necessarily end once and only once the final cap is reached. Third, the FOMC could end runoff early but continue to shrink reserves more gradually through growth of nonreserve liabilities, an option also mentioned in the December minutes. There is a scenario in which the FOMC ends runoff in September but keeps the total size of the balance sheet flat so that reserves are squeezed from one side rather than two, unlike the current approach illustrated above in Exhibit 3. Only once full normalization in the sense of hitting the appropriate terminal level of reserves is reached—end-2020, in our example—would the Fed resume growing its balance sheet in line with growth in demand for its liabilities. Regarding the Fed's possible motivation for slowing the pace of reserve shrinkage through these latter two options, Goldman suggests that this would be to lessen the risk that runoff overshoots. As the December minutes note, if upward pressure on the funds rate arises, it could be “challenging to distinguish between pressures that were transitory and likely to abate as financial institutions adjust and those that were more persistent and associated with aggregate reserve scarcity.” Fed officials appear sympathetic to “approaching that point quite carefully,” as Powell put it in his January press conference. But the runoff caps were chosen to be conservative in the first place, and it is not clear that a policy change is necessary. A simpler alternative noted in the minutes might be to simply use open market operations to smooth any particularly large fluctuations in reserves. 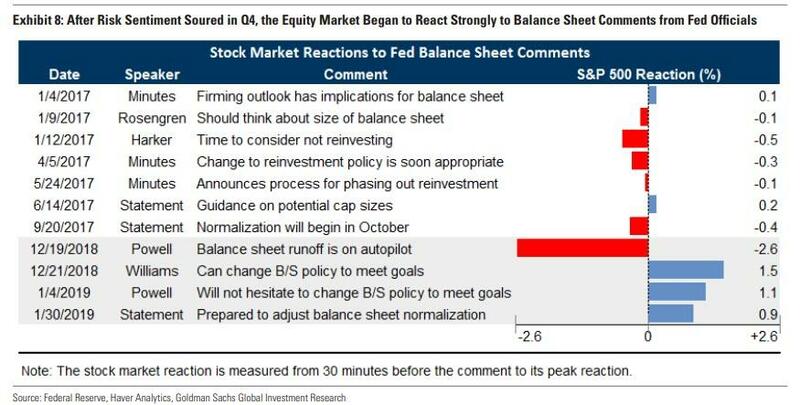 There is one final question regarding the Fed's balance sheet rolloff, namely involving MBS - the one asset class whose rolloff many analysts, specifically those from Morgan Stanley, have suggested has the highest impact on risk assets. Answering the question whether the Fed will explicitly sell MBS instead of merely waiting for them to mature especially with the intention of reducing the average duration of the Fed's balance sheet, Goldman responds that "MBS sales are possible and a deliberate shortening of the maturity composition of Treasury holdings appears likely, but not this year." As the bank elaborates, after the Fed’s balance sheet reaches its terminal aggregate size, two changes to the composition of the portfolio— both of which have been discussed for years and featured in the December minutes—appear possible. The first proposal is to sell MBS. The motivation is that returning to a primarily Treasury portfolio is likely to take a long time under passive runoff. 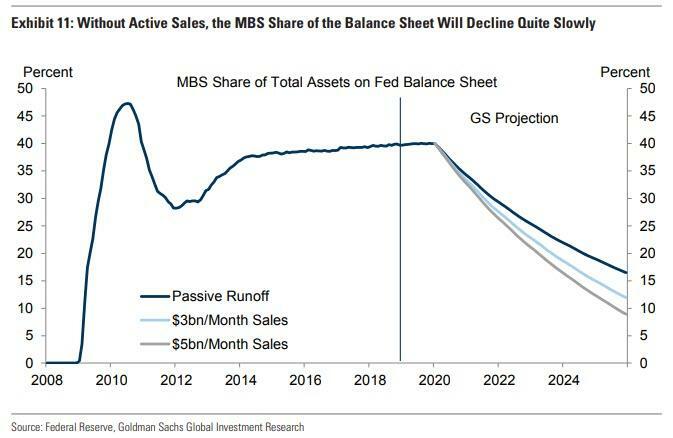 Goldman projections imply that without sales, MBS would still represent over 15% of Fed assets by end-2025. Exhibit 11 shows that this process could be accelerated by sales at even a “very gradual” pace, as mentioned in the December minutes. For example, if the FOMC were to supplement passive runoff of maturing MBS with $5bn in monthly sales—a meaningful but plausible addition to the roughly $10-20bn current pace of monthly net issuance in the MBS market–the MBS share of total assets would instead decline to under 10% by end-2025. As shown in the left panel of the chart below, the average duration of the Fed’s Treasury holdings increased sharply during the crisis and remains well above the pre-crisis level. 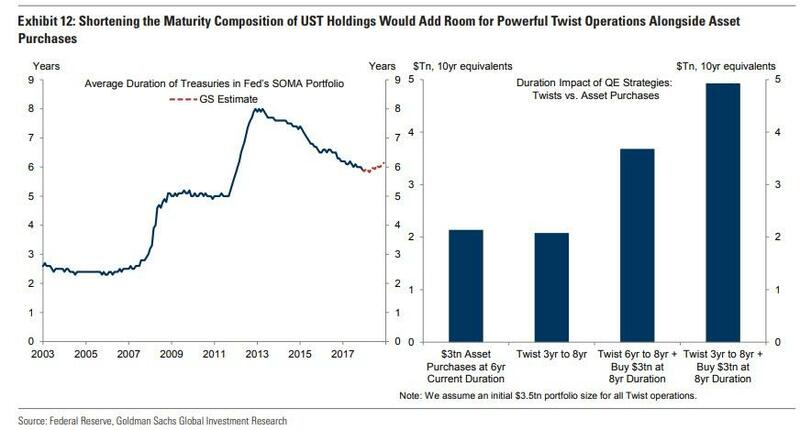 The right panel shows that extending the maturity of existing UST holdings—a “twist” operation such as the one which was recently proposed by Nomura — can be a powerful complement to asset purchases. For example, extending the average duration of a $3.5tn portfolio from roughly the pre-crisis level to the QE-era peak would be as powerful as purchasing an additional $3tn at the current average duration of the Fed’s UST portfolio. Using both tools together according to Goldman would provide even more firepower for, drumroll, future QE programs, as shown by the last two bars. Note: future QE is now not a question of if, but when. As a result, Goldman see an eventual deliberate shift toward shorter Treasury maturities— including bills—as likely, especially if the Fed hopes to i) steepen the curve aggressively and ii) unlock space for more QE in 2020, or just after the next recession hits.